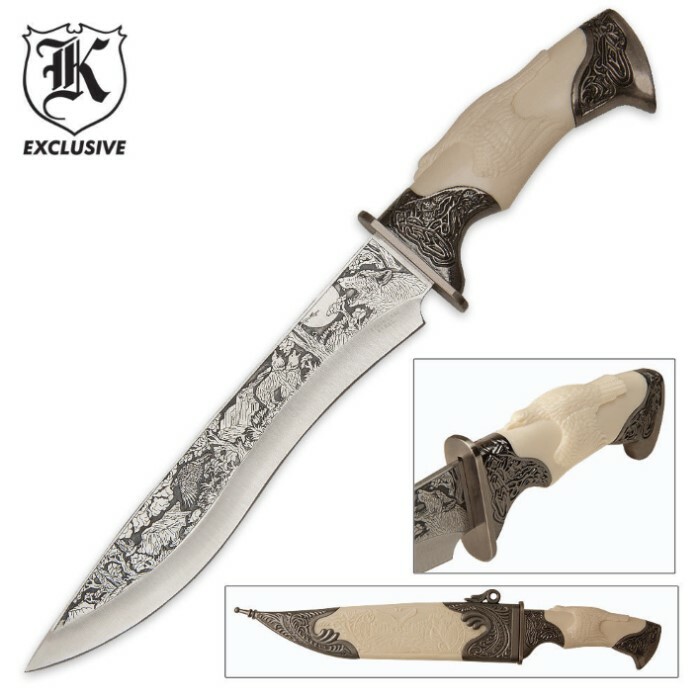 Tribal Faux Ivory Eagle Bowie Knife | BUDK.com - Knives & Swords At The Lowest Prices! This is a collector's quality limited edition bowie to pass down for generations to come! 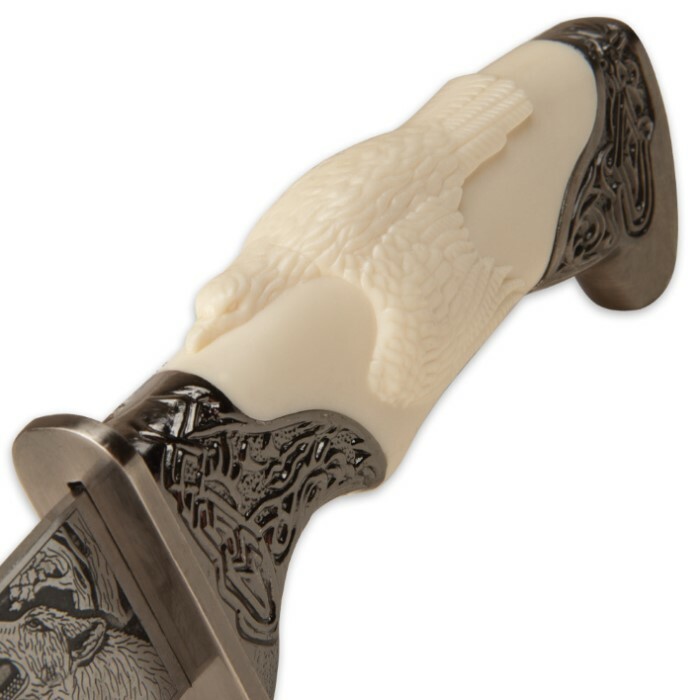 The ivory inspired handle with its ornate design and gemstone, in combination with an intricate wildlife scene etch on the blade, makes it truly heirloom worthy. The 9 1/2" blade is forged, precision ground stainless steel and the bowie knife is 15 1/2" in overall length. 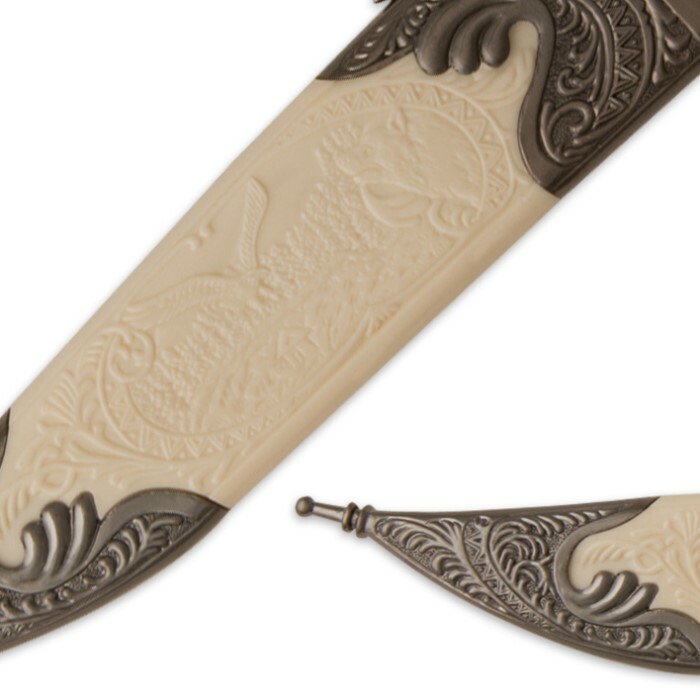 A matching, ornate sheath is included to house the magnificent blade. Don't miss out on this incredible looking bowie knife, it's a real showpiece! This Bowie Knife is beautiful!!! But I would say its more for display. The plastic shaped as a jewel comes off easily showing the screws and what not. The health is wonderful just as well. A great piece all together. Don't let the condition of this knife fool you when you pull it out of the box. Just get the mothers cream paste or never dull and polish it...Mine is WAY better than i expected. This was a great looking knife priced right for a Christmas present for family. It was so nice and the sheath is thick that I bought 2 more for gifts. I have already shared this link with friends looking for a unique gift for a husband. It looks like a family heirloom! I was very pleased with the appearance of this knife and sheath. Well worth the money. A little color variation or marbling in the handle would be an improvement so that the handle would not appear so 'plastic' but the design is good with the eagle on the handle's spine. It seems there is a magnet imbedded in the sheath which causes the knife to snap into place and stay put. Nice engraving on the blade and quite ornate. It is a good knife to collect for the money. I can picture someone in the book 'Ivanhoe' having this piece on his belt. The sheath is reminiscent of something made centuries ago. Good job on this one BudK. Thanks. Beautiful sharp knife! More than what I expected! Wife fell in love with it straight out of the box! Beautiful design on the blade and I hung it on the wall with as screw. Nice showpiece for the money with a reliable blade! The knife looks very exotic collectable like fom the times of kings! A must buy!